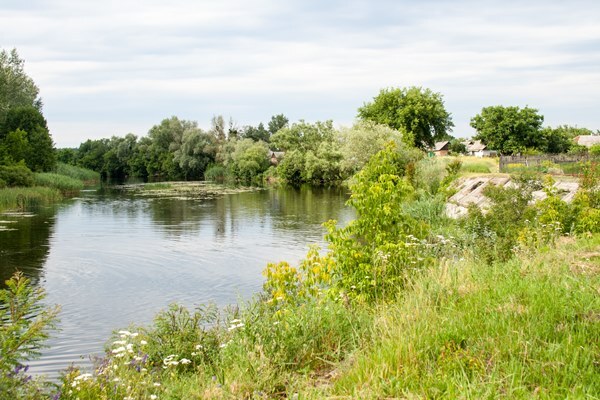 Bonfires are being prepared on the sandy beach lining the Vorskla, a river that cuts Poltava in half and hugs our hamlet within the city’s suburbs. One group of girls is busy weaving wreaths from wild flowers. Heaps of daisies, yarrow and cornflowers are spread out on the ground around them. Further along the bank, grills are being set up, and people are staking out spots with towels and empty crates. It is still early enough, several hours before the sun takes a dip in the river. The scent of hot sand, hay, wild thyme, cigarette smoke and water lilies hangs heavy in the still air. We are waiting for Ivan Kupala’s Eve. Ivan Kupala is the Slavic version of the midsummer festival marking the summer solstice. According to the old style Julian calendar used by the Orthodox Church, it’s celebrated on the night of 6/7 July in Ukraine. (In neighboring Poland, Noc Kupały, just like the Swedish midsummer celebrations, takes place on 23/24 June.) Ivan means John (as in John the Baptist) and Kupala comes from the Slavic word for bathing. Although Christian traditions are woven into the festival, the roots are clearly pagan. Water and fire intertwine in various rites, and the river is worshiped as much as the saint himself. Today, the celebrations may involve more beer and barbecue than romantic rituals, but women still float wreaths in the streams to divine their future. Candles are still lit on the river bank. Couples still jump over the bonfire to test the strength of their relationship. In Nikolai Gogol’s story, “Midnight on the Eve of Ivan Kupala”, a young man makes a pact with the devil to find the fern flower in exchange for money, and ultimately, his beloved’s hand. Fern was said to bloom only on Ivan Kupala’s night, and if the seeker’s motives were pure, it could grant the most ardent wishes. Ferns reproduce by spores and don’t flower, but it doesn’t prevent villagers from roaming the hills in search of other herbs. It’s believed that plants picked on the eve of Ivan Kupala possess the strongest medicinal properties. 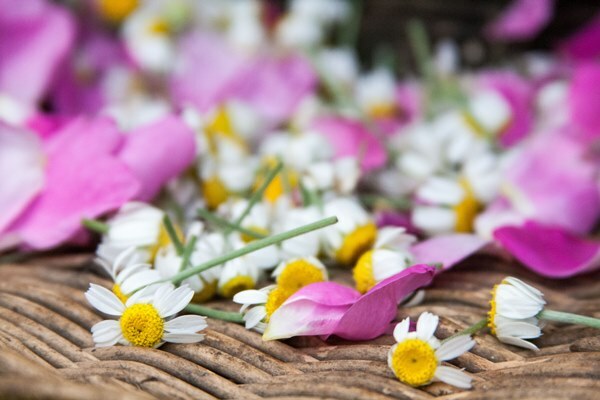 Besides the mystical, there may be a scientific explanation for the richer concentration of essences in herbs around this time. 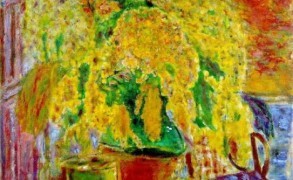 Early July is the prime blooming season for many plants in Eastern Europe. 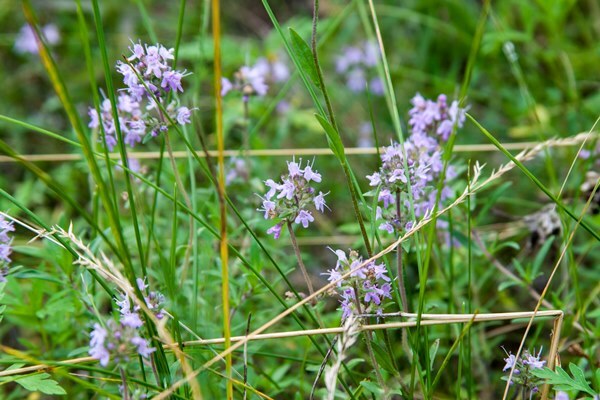 Wild thyme starts to flower, and you only need to crush a stem with your fingers and rub the fuzzy purple flowers behind your ears to be perfumed for hours. Broom smells as if someone let the honey boil over. Carnations smell searing hot of pepper and cloves. The hillsides become a patchwork of different colors, which will fade over the course of the month as the sun becomes scorchingly hot. Earlier in the day, I set out in the meadows behind our house, walking along the Vorskla. 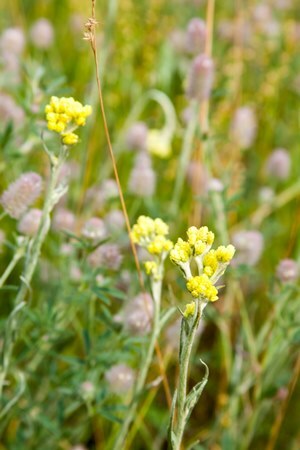 These wildflower walks have a dual purpose–I enjoy the summery aroma of the countryside and I pick herbs for tisanes. My great-grandmother grew up in the village and lived through the hardest decades of the last century; herbs helped her survive when there was no access to medicine. Later, she supplemented modern pills with traditional herbal blends. Raspberry tea was our first aid whenever we caught colds. Chamomile tonics soothed rashes. Pine bud steam baths relieved stuffy noses. I have absorbed all of this lore as readily as I have her passion for scented flowers and beautiful fabrics. Just outside our gate, I spot a patch of German chamomile livening up the pathway with white and yellow polka dots. It smells like spicy green apples and musty wood, and on its own, it makes for a bittersweet cup of tisane. Better yet, is to add a spoonful of dried rose petals and lavender for a richer, honeyed flavor. 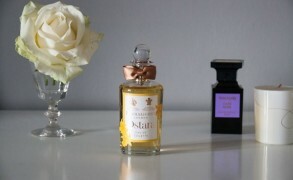 Since rose and chamomile are some of the best complementary notes in perfume–try Clinique Aromatics Elixir and Serge Lutens Sa Majesté de la Rose to see what I mean–there is no reason why they can’t be paired for tisanes. The river banks are covered with a carpet of wild thyme, which turns purple-blue as the summer rolls on. At midday the fragrance fills the air, veiling the whole riverside with a spicy, pungent warmth. 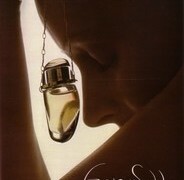 Why have I never found this fragrance in a perfume bottle? I stuff several stems into my purse and shirt pockets and feel glad that I skipped a splash of orange blossom cologne. On reflection, a teaspoon of orange blossom water mixed with black tea and wild thyme would be perfect, and I pick a small bunch to dry for the winter. Immortelle is one of my favorite perfume materials for its complex scent of maple syrup, spicy musk and black walnuts. The combination sounds incongruous, but a mere accent gives fragrances like Etat Libre d’Orange The Afternoon of a Faun and Hermès Brin de Reglisse a distinctive character. If you have more tolerance for immortelle’s heavy presence, then nothing beats Christian Dior Eau Noire and Annick Goutal Sables. They smell exactly the way our sandy strip overgrown with immortelle does. I take only a single stem to dry between the pages of my diary. The paper will hold the nutty perfume for months. 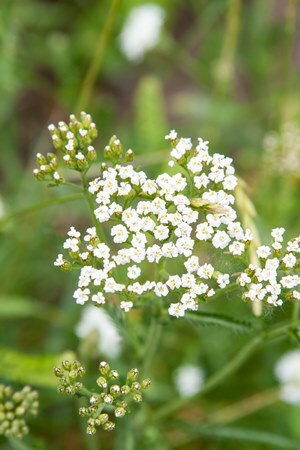 Bitter is yarrow, a tall plant that blooms white or yellow. My great-grandmother swore by it for various medicinal blends, but I only smell the flowers and rub the lacy leaves, which leave a camphorous, piney scent on my fingers. Another bitter herb I spot in abundance is sage. It flowers amethyst-like purple and I can see its bright spikes all over the hills. Wormwood growth spreads like molten silver, and it’s good to sit somewhere under a pine tree, close my eyes and breathe in its intoxicating, bittersweet aroma. The horizon is still bright, but the shadows creep slowly into the valleys. The setting sun colors the grass gold and sienna, and I can see the first tentative glimmers of bonfires on the beach. Ukrainian pop songs echo through the valley. I see groups of people walking towards the river, carrying picnic baskets and blankets. I get up to join them. The Eve of Ivan Kupala is here. 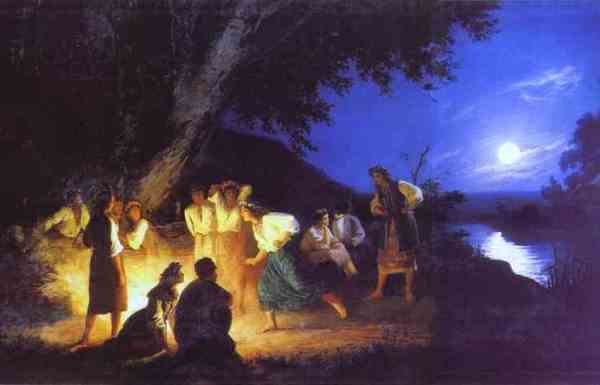 Painting: Night on the Eve of Ivan Kupala by Henryk Hector Siemiradzki, via wiki-images, some rights reserved. The rest of the photography is by Bois de Jasmin. Anne of Green Gables: Hi V, I had a really busy week which prevented me from visiting your blog but it’s wonderful to hear that you’re having a great time in Ukraine. I keep praying for peace in your country. Victoria: Thank you for your nice words! It means a lot. Anne of Green Gables: That is a big advantage indeed! Since I didn’t grow up with natural perfumery materials around me, I’m trying to learn more about them now. I started taking frequent visits to a local botanical garden and I’m trying to find good guide books on flowers and trees. Cornelia Blimber: What a beautiful text & pictures! You really are a very talented writer. How fascinating that old, pagan traditions are still persisting. Your description is very evocative. Victoria: Thank you so much! When I was little, we used to camp out in tents on the river bank, picnic, dance and swim. It was a little frightening but also a lot of fun, since there were lots of people around. Cornelia Blimber: Hi Anne! Yes, I enjoyed it. Beethovens last pianosonata’s are holy for me, if I may say so. It is more than music, it is profound philosophy. Krystian Zimerman is certainly a pianist who can interprete these works. So I was very angry and disappointed when he disturbed my concentration with some insignificant talking. And he granted us no time to build up new concentration, but began immediately with the sonata in c minor no. 32. opus 111. Annette Reynolds: Victoria, this is such a beautifully evocative essay that I found myself closing my eyes after reading a sentence or two, just to savor the imagery. I could relate to the scent of Broom, as I have – probably – the only Spanish Broom plant in the Puget Sound Region. I’ll never forget the first time I smelled it: I had to follow my nose to the small nursery that happened to have several large bushes growing outside their gate. I bought a small plant then and there and planted it so that it’s gorgeous fragrance would waft throughout the house (and up into our bedroom). Here, it blooms from early May to late July and is my favorite fragrance in the garden (and that’s saying a lot, since I love so many)! Small-minded bureaucrats have labeled ANY Broom a noxious weed here in the Northwest (and, yes, the Scotch Broom that runs rampant everywhere should be considered a pest) and so I have to guard my plant carefully. (The nursery that sold them was told to remove them!) It has never once reseeded (much to my dismay) and so this is the year I plan on trying to make a cutting so that I’ll never be without this wonderful scent in my life. rainboweyes: Although I’m familiar with this tradition (under the name of St. John’s Eve, though), it was never celebrated when I lived in Poland. One of the explanations I found is that the Polish catholic church tried to suppress it because of its pagan roots and rituals. However, it seems that it’s experiencing a revival nowadays. As I was a child, my mother also used to collect herbs and we made various tisanes. Victoria: What is the name of that Latvian company? There are many Latvian products here in the stores, so I could check if they carry it too. rainboweyes: The company’s name is Dabba. Another Latvian brand with many nice natural body care products (body dessert collection with various body marmalades!) is Kivvi Cosmetics. Cornelia Blimber: Hi Rainboweyes! I dabbed ISM (that means, I sprayed on my fingers and then dabbed on my wrist, maybe that gives the same result as dabbing from a splash bottle). Bea: What a lovely essay Victoria, I can almost smell the herbs just by reading your description. I can imagine the atmosphere and the scene, and some of the scents (I love chamomille, sage, wild thyme, and immortelle). As long as people celebrate, weave wild flowers, pick wild plants, value and use them, love the sunset down the river, remember what great-grandmothers taught them, I believe we are not lost. solanace: This was just beautiful, Victoria. Your blog is a celebration of feminine culture, and these surviving bits of pagan knowledge that are passed from mother to daughter are fascinating. I rely very much on herbal medicine, especially for the kids, since they always have a cough or a harsh or an insect bite. Thank you for sharing your refreshing view of Ukraine. How colorful it all is, when you are walking instead of inside a car! Victoria: Oh, thank you so much for this recommendation! I browsed through the book, and I loved it. Might get a copy once I return home. There is something so fascinating about all of these intricate customs, traditions, and superstitions. solanace: I grew up in a plain landscape, the cerrado. Google if you have time, it´s beautiful. From a car it seems there is nothing there, but if you go walking you notice there are soft hills and small creeks, little clear streams forming tiny waterfals and many colorful little flowers all around, year long. Austenfan: Reading your lovely post on summer in Ukraine I was suddenly reminded of our summer holidays in Norway when I was little. It must be wonderful to have all these knowledgeable ladies on one family. You are very blessed to have (had) them. Austenfan: We stopped visiting Norway when I was 11 or 12 years old. So I have all these images in my head of fjords and glaciers but have absolutely no idea where to situate them. Victoria: You’re so right, Sanna! When I worked in Poland, I kept thinking how familiar the landscapes looked, and I loved the ladies by the side of the road selling various berries and wildflowers. I can never resist those ladies and their wares. Ariadne: How lovely, enchanting and transportive! (should be a word, if not ;+&).